Hey everyone. Nice to be posting a new song for you all. This one has been “in progress” for about 2 months. Why the delay? Well, I am now the one playing the drums & I am a bit rusty. 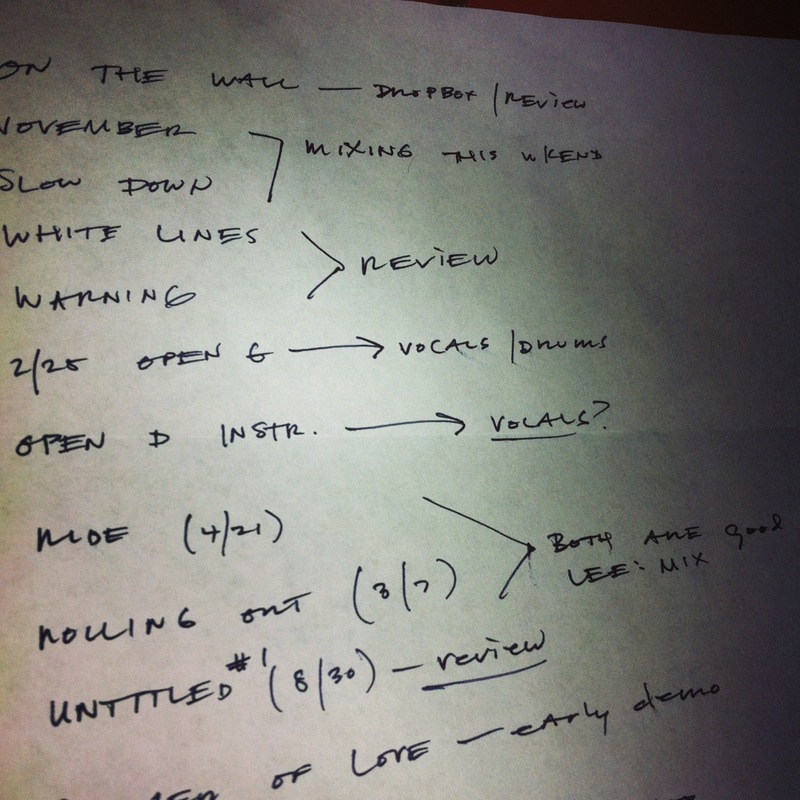 So, as I’ve been working out the kinks (with Chris’ help & patience)…some of these new songs have been a bit delayed. For that, I apologize. I am excited to tell you that the kinks are starting to work themselves out…you have to love progress, right? This song started as a demo that I wrote one day in April. A couple of weeks after I wrote it, I listened to the demo again. That demo had no words, but I loved the groove in the chords. I plugged in, tuned up & hit record. Not long before I recorded this, my wife & I had moved into a new place & we were in the process of unpacking boxes. One of the first things that I wanted to do was put some family pictures on the wall to make it feel like home. That must’ve been on my mind because the words came out in a rush. We have several other new songs that we’ll be releasing soon, so please stay tuned! As always, thanks for your continued love & support. Hope this message finds you all doing well. Just wanted to give you a quick update about what’s going on with us these days. We’re both excited about some new tunes that are in the works. Last time I checked, we had about 10-15 solid working ideas that are all in various stage of recording/mixing/demo-ing/etc. Give how busy we’ve been outside of the band, that’s pretty shocking to me! There are a couple that are very close (Fall So Far & On The Wall) & they should be done soon. We’ve also been having some fun with recording a cover or two that should see the light of day sometime this year. This collection of recent songs is definitely turning into something (in my opinion), so stay tuned to see what we end up doing with them! I’ve also decided to embark on a solo project. It’s still in the early stages & it’s very personal to me. I’m sure that Chris will be adding stuff to that record when the time comes, but right now I’m just taking my time with it & exploring the theme at hand. More info on that as it becomes available. Big thanks to everyone for their love & support! Chris & I have been at this for almost 3.5 years & we don’t plan on stopping anytime soon! Cheers & see you at the show! Hi friends, and happy Thursday to you! Matt and I are excited to share another recently finished song called ‘Easy Way.’ This is another song that had a long road to completion. I think I wrote the music for it early last spring after upgrading the drum heads on my kit to Evans and Remo Emperor’s. This was a song that was written shortly after breaking them in. I’d set up my mics and board, hit record and just started playing. 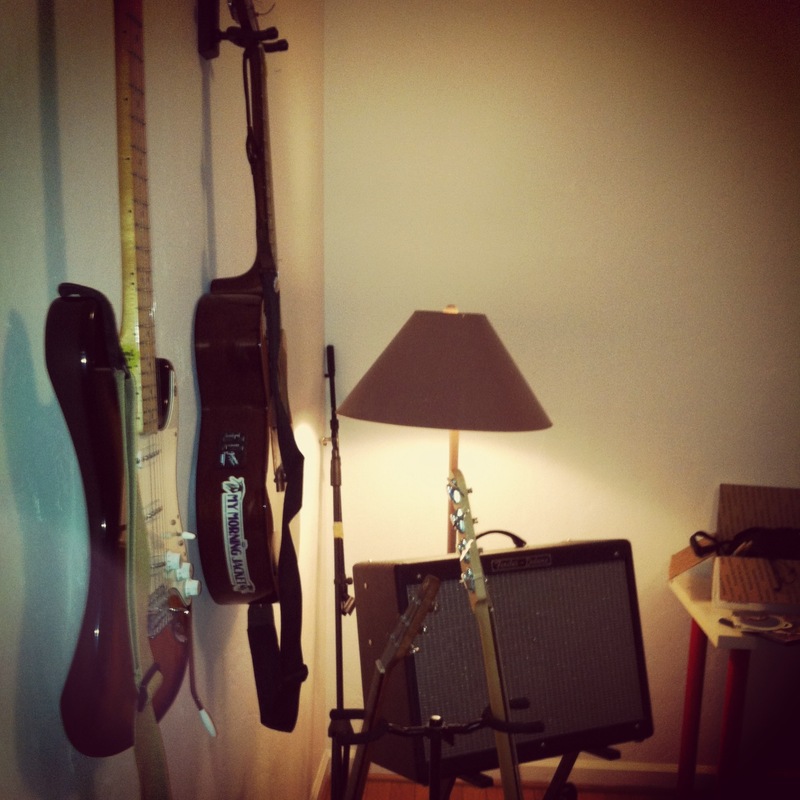 I worked up the guitar and other elements after listening to the drums I did over a few days. There are a few songs that have started as drums first and everything else added afterwards – and this is another one. It’s a weird way to write music, but all part of working alone on demos I suppose. Anyway…I sent Matt the music last year and he started piecing together his vocals/lyrics and guitar leads. Flash forward to last month and this one came back up as one that we both liked a lot. Hope you enjoy it! Matt and I are excited to share a brand new song with you today! It’s called ‘Constant.’ This song has been a very long time in the making and was written 13 months ago whilst in the middle of production for our last record ‘Where It Began.’ It’s part of a wave of 25 songs I started writing after we had identified tracks for ‘Where It Began.’ This was one that Matt gravitated towards in July 2012 and had started some basic vocals on. Then life got busy for us and ‘Constant’ was shelved until last month when we started rounding up songs that were in various stages of completion. The additional work on it took some time – and included some pretty radical changes from the original recording. ‘Constant’ is a strange one to me in that it’s not a very long song. I recall wanting to write something really short, but that had a big sound, and a crest that built up high and washed out immediately. That crest ended up being about 3-4 different guitar solo’s before I settled on the one you hear in this recording. Matt got a hold of the song again in March 2013, revisited his vocals/lyrics and added some amazing guitar work on it. He is playing that ambient/distant guitar lead you hear in the song. He had this idea of accompanying the guitar solo you hear, with another guitar solo, which is not something we have done a whole lot in Cluthe/Lee. In the end though, the competing guitar solo’s really turned the song into something much more than it was to start with. I really love how Matt’s vocals drop in and out of this song. He’s so amazing at finding his pockets and driving home lyrics that for me, swim in my head for days after. In the end, there were too many last second additions to mention on ‘Constant,’ and I’m thinking that the approach we’ve employed since finishing out last record is a good one. Very patient, not rushing things right out to the interwebs. Letting songs breathe and develop as we listen to the demos over 2-3 week periods. Don’t get me wrong, there are still plenty of moments where we dial into something and that’s it. That’s the song and we release it with little tinkering involved. ‘Constant,’ just by the fact that the music is 13 months old, is a song we took lots of time to dial into and back into. I think the song is saying that we’re focusing on what we feel are the strongest songs out of a group of about 50 + songs we’ve got going right now. 2012 was a crazy year of change for Matt and I, yet we continued writing music all the time. There are so many ideas we have, per usual and I know we’re both excited to continue sharing what we do with you all. Till the next one….be well! Matt here. Just wanted to share a glimpse of part of our working song list with you all. We’ve both been very busy lately, but we’re about to put our foot on the gas in the coming weeks. This is only a fraction of what we’ve been working on both individually & collectively. These songs are the most complete & a few of them are done & just waiting to be mixed. What do they sound like? Well, some are bluesy, some are heavy, some are experimental, some are acoustic/slow & some can’t be classified. We’re excited about them & I can’t wait to dig into them this weekend & wrap a few of them up. Stay tuned….we’ll be updating you all as we finish them. Have a great weekend, everyone! My wife & I recently moved & we’re slowly settling in to our new place. I’ve been starting to piece together the new home studio & I can’t wait to start recording again soon. Chris & I easily have 20+ songs/demos between the two of us & we’ll start working on them very soon. We’re still easing back into it after the release of Where It Began, but we’re both ready to record some new stuff very soon. If I could describe what I’m hearing from his demos in one word: eclectic. They can’t be pinned down & that’s exciting. So, stay tuned!! We’ll be unveiling some new stuff very soon! Until then, take care & be well. There are several “older” songs of mine that I’ve been wanting to properly re-record with Chris since we started Cluthe/Lee. This is the main song that I was itching to re-record. It was written back in 2005 & we tried rehearsing it with my old band, End Result; but it just didn’t fit our sound. This is easily one of my favorite songs to play & sing and I’m really excited with how it turned out. I have to give Chris credit…he keeps asking me to look back & find older songs that I’d like to work on. Take a listen & enjoy! You Can Stay Below Cluthe (words/music): vocals, guitar, bass Lee: drums, guitar "You Can Stay Below"
A lot of people ask me what my lyrics are about. They’re open to interpretation, but I decided to reveal the album track-by-track once it was finished. This led me to examine the meaning/inspiration of each one of these songs. Enjoy! 1. COMING THROUGH: Where It Began starts off with a song that almost made it onto our last album, Life Can Go. It was finished shortly after we’d tracked that album, so we decided to save it for the next album. We also knew that it should open the album from the get-go. Lyrically, it serves as a warning of sorts. When people count you out, this is the reminder that you’re still here…still viable…still beating & ready to break through any walls that have held you back. 2. THE GHOST:Chris: The Ghost is the second song on Where It Began. It was an 11th hour addition to the track list and one that Matt wrote earlier this year. Huge chorus in this song – and one you may find yourself easily swept up in. Matt: Like Chris said, this one was added at the last minute. It just seemed to really fit the tone of the record. The lyrics date back to 2003. I found them in an old notebook & re-worked the chord structure. The “ghost” is within all of us. I couldn’t retrieve it in my mind. This scared & saddened me a great deal. I remember talking to my wife about it & she calmed me down…by telling me that his voice would return. She was right. I had the most vivid dream. When I woke up the next day, I quickly jotted down the lyrics & didn’t leave anything out from the dream.This song is a gift from my Dad. I hear his voice loud & clear every single time I play it. Laurel adds some truly amazing vocals on this track. Chris’ drums are fantastic. Thanks for the gift, Dad. Chris wrote the music to this one & I was immediately hooked. For having such catchy music, it really opened the door for me to write the lyrics in a different way. The music seems light-hearted, but the lyrics are the opposite. To me, it represents just how naive we all are to the world around us. We turn away from reality more often than we should. This song came together very quickly. I was recording some lead lines for a different song in an alternate tuning. 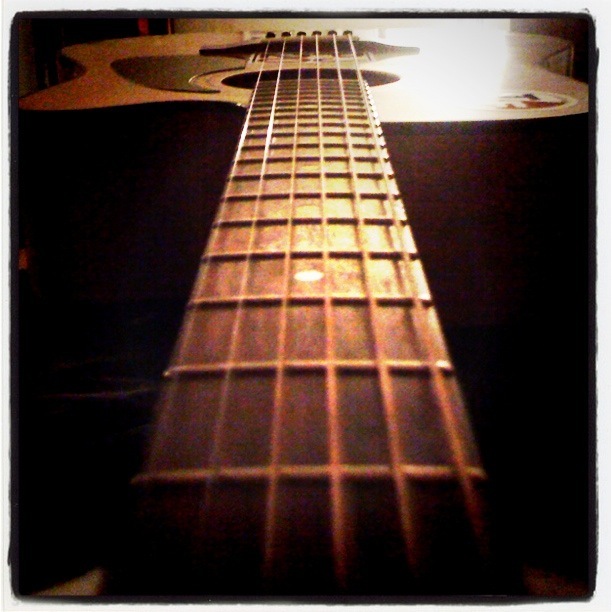 Once I finished recording my parts, I dirtied up the guitar sound a bit & had some fun. It was recorded & written at the end of a long day. I think some of my exhaustion spilled over into the lyrics while thinking about work. This is probably the first song that I wrote while using a slide for the whole song. Chris has some amazing leads on this song with great tones. Life Anew was one of the last songs to make the final track listing for Where It Began. had tried going to sleep, but had no luck. By the next morning, the storms had passed & I finished writing the song.After I wrote it, I rarely found myself playing it. Now I strum it on my acoustic quite a bit. Songs are funny like that. This song is a trip. When I started writing it, I decided to really let loose & experiment. Multiple layers, voices, textures…all swirling together. A controlled chaos, if you will. I remember telling Chris that I was experimenting with layers & loops. He was pretty excited. I was really excited to see what he’d add to the song. He took it far beyond the next level. It just builds & builds & builds….The silence at the end is the beginning of the chaos. I’m a big fan of the blues. I’m also a big fan of spontaneous, simple & fun tunes. I was recording another demo on my strat & really loved the dirty tone I was hearing. So, I plugged in the mic so both the strat & mic had the same tone. I started strumming a simple chord progression, then hit record. I recorded the rhythm guitar & vocals at the same time. No pre-written lyrics or ideas…I simply went with it. I sent it to Chris & said “have fun.” What he sent back floored me. Drums, bass & lead guitar…that’s all him. When tracking this album, this song just felt like a no-brainer to both of us. It had to be on the album. It sounds like we’re in the same room just having a blast. but it really thumps. It’s one of the heaviest songs he’s ever sent me, that’s for sure. When I heard it, I was really excited. It had an attitude to it & a sense of immediacy. I listened to it a few times while developing some lyric & phrasing ideas. The stops & starts of the bridge were challenging, but so much fun. I’m constantly reminded of how lucky I am to be writing with this guy. Much like The Ghost, this song was a late addition to the album. It just seemed to fit the tone of the record in so many ways. It has this sense of uncertainty & menace to it. The person in the song is drifting…looking for a foothold. Something (or someone) to grab onto to help show them the way. When everything looks familiar & you don’t know who or where you are…Time spins, time falls. one peaceful & one aggressive. What we think we know vs. What we should know. In all of the years that I’ve been writing music, no other song has been stuck in my head more than Unfolding. There is just something about it that I can’t shake. I immediately thought that it would be a great way to close out Where it Began. The album title comes from the lyrics in this song, after all. To me, it’s about letting go of past regret & finally coming to the realization that the possibilities are endless. The future is right in front of you. It’s unfolding.